The Hartselle City Cemetery is located at 1100 Railroad Street N.W. Anyone in need of cemetery lots for burial should visit City Hall located at 200 Sparkman Street N.W. to view a map of available burial lots. In this section, we hope to provide you with the necessary information to make the final arrangements for your deceased loved one easier. Each individual burial lot in the cemetery is part of an eight lot section to form one block. The size of a cemetery block is 20×20. Each burial lot is 5×10. The cost of one individual lot is $750.00. Cash or check may be presented for payment; we are unable to process debit or credit card transactions. Partial payments are not accepted. 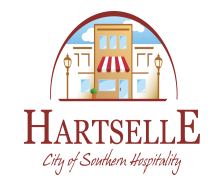 The City of Hartselle does not handle the opening and closing duties for burial. These duties should be handled by the chosen funeral home. However, the funeral home must contact City Hall before the opening so we can mark off the grave to ensure accurate burial. City Hall must be informed before the placement of monuments or grave markers to avoid placement errors. The Park and Recreation Department is dedicated in trying to make the final resting place of your loved one look its best by performing duties such as mowing, removing weeds, and filling in settled graves when needed. There are no yearly fees for the City Cemetery. A percentage of the monthly lot sales are appropriated to the Cemetery Perpetual Care Fund for the continual upkeep of the cemetery. The City of Hartselle does not handle the transfer of interment rights for a burial lot from the original owner to another. We should, however, be notified of any such occurrences to guarantee that the proper documents are completed and our records are accurate. Please contact the City Hall at (256) 773-2535 for any other questions or concerns.